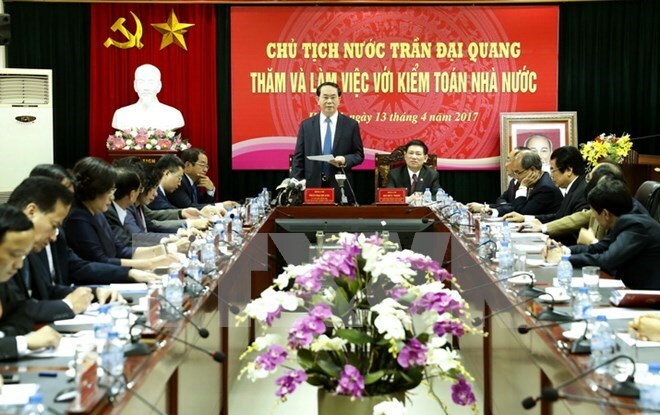 Hanoi (VNA) – President Tran Dai Quang has urged the State Audit to focus more on sectors and areas with high risks of corruption and cases of public concern, thus giving advices to authorized agencies on how to adjust policies and legal regulation to prevent corruption. At a working session with leaders of the State Audit on April 13, the State leader suggested that the agency pay attention to such areas as land use, natural resources, mining, environment and capital construction. The State Audit should include programmes and projects using foreign loans in its annual auditing programmes, and advise the President, Government and ministries on how to effectively use and manage foreign loans, he said. Along with giving early alert on any arising issues related to fiscal, financial, credit and banking policies, the agency should also give consultation to the Party and State on major procurement and investment projects as well as the annual budget estimates, stated the President. The State leader also requested the State Audit to speed up the drafting of documents guiding the implementation of the Law on State Audit 2015, and required ministries and localities to work closely with the State Audit and create favourable conditions for the agency to promote its role in the political system. President Quang urged the audit agency to expand international relations and successfully organise the 14th Congress of the Asian Organisation of Supreme Audit Institutions (ASOSAI) in 2018. Last year, the State Audit conducted 276 audits and proposed financial corrections related to 38.3 trillion VND (1.68 billion USD), the highest figure in 22 years of the agency’s operation. It also recommended the adjustment, supplementation, replacement and withdrawal of 150 legal documents to prevent losses and wastefulness. The agency re-evaluated State capital in seven enterprises and revised up the amount by 20.8 trillion VND (917 million USD). Meanwhile, after examining 27 transportation BOT projects, the State Audit proposed cutting the combined duration of toll collecting by 107 years compared to their initial financial plans. This year, the agency will increase the application of advanced technology in its operation to improve working capacity and effectiveness.